The acknowledgments obtained demonstrate the commitment of P.S.A. GROUP in giving concreteness and reliability of the Management Systems that are applied with the contribution of the people who work there. Each one, individually or together, takes part in moments of professional updating and, here below, we show some examples of our growth paths. P.S.A. 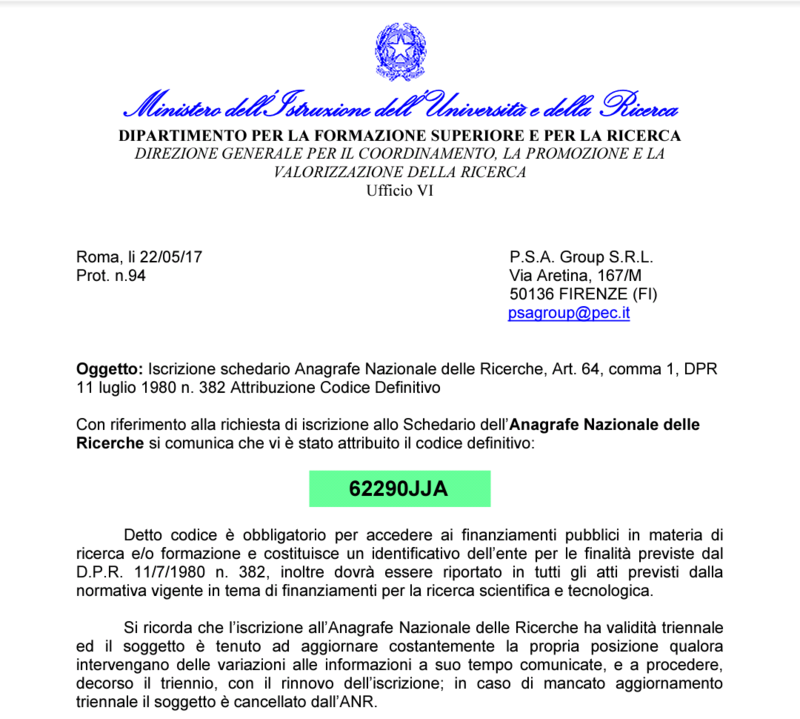 GROUP’s services have been awarded by the Italian Ministry of Defense and by the United Nations with the certification of high quality standards. With NATO AN140 code, P.S.A. 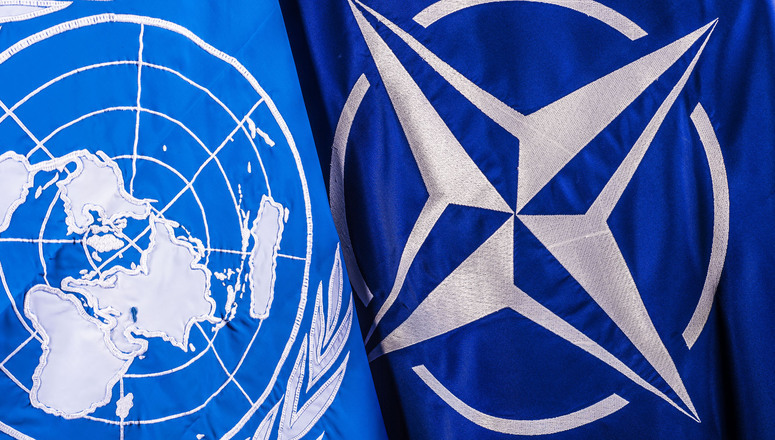 GROUP was acknowledged as a successful partner in providing security services to NATO bases in Italy, to the Government of the United States and to National Defense of NATO Countries. 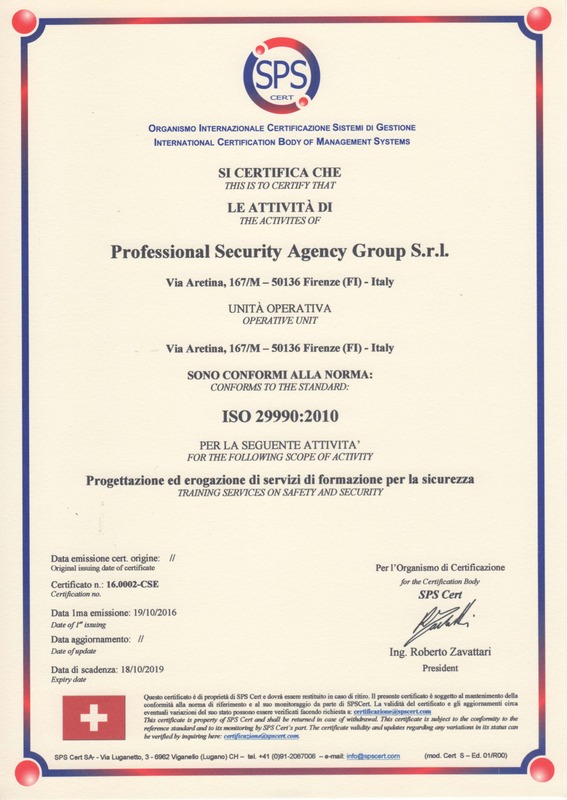 Certification UNGM 395498 allows P.S.A. GROUP to provide its unique services all those organizations and offices that are affiliated to the UN System or that act on its behalf. 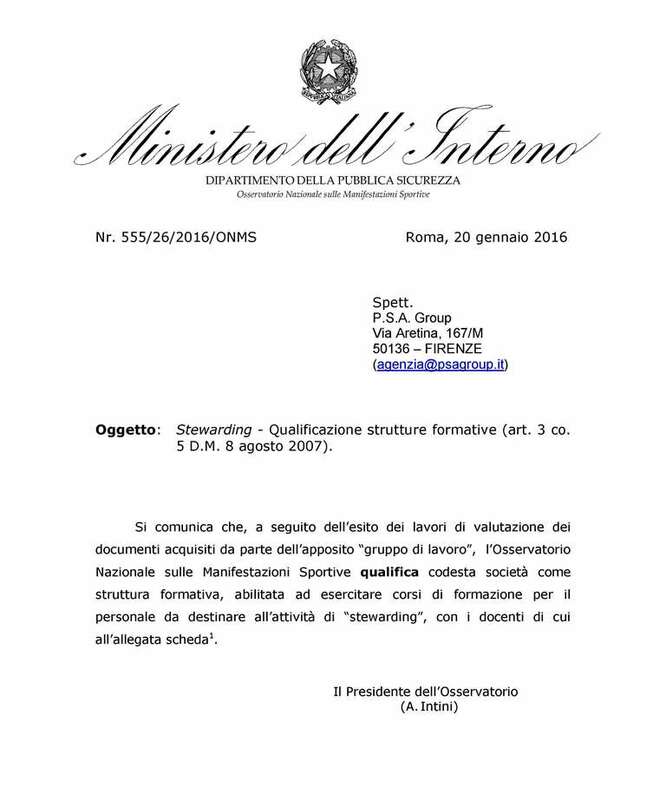 With the 8/10/2007 bill that oversees the use of sport events stewards, the Italian Ministry of Interior has defined the legal framework and guidelines to operate in support of Law Enforcement with tasks that range from crowd security management, gates and stewarding at sport locations during major events. P.S.A. 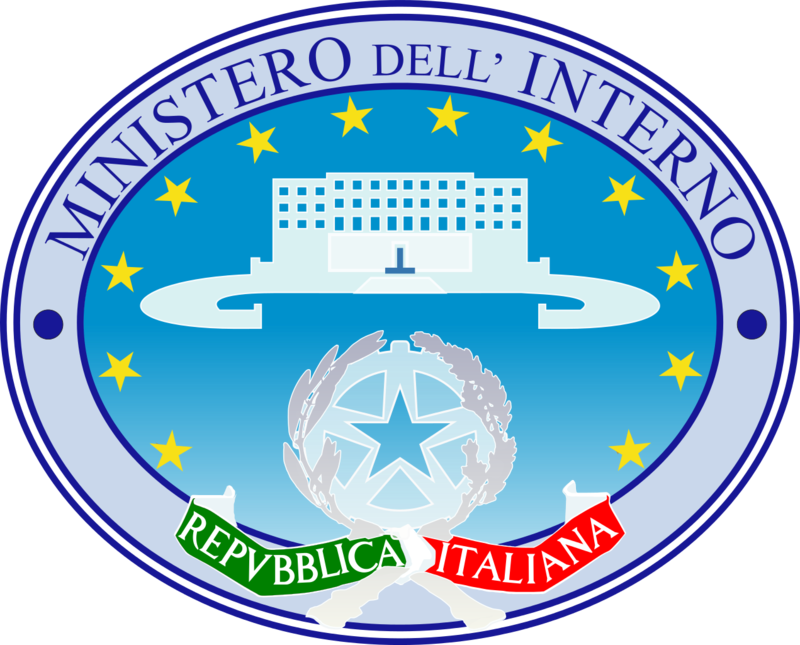 GROUP has achieved the Italian Ministry of Interior the certification to act as an educational body and therefore empowered to organize professional training for “stewarding” personnel deployed at sport events. P.S.A. GROUP has been admitted in the Ministry of Education, University and Research’s National Registry, with the goal of organizing and managing training and refresher courses for soldiers and civilians working in missions abroad. P.S.A. 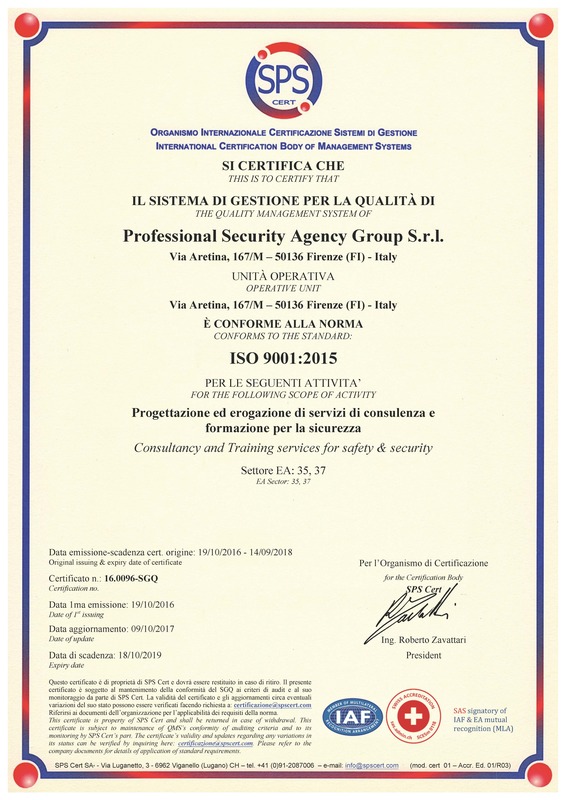 GROUP has been awarded by SPS CERT in Lugano (CH) with the ISO 9001:2015 certifications for the quality of its services and with the ISO 29990:2010 for the quality of its training.